She made a request for a church to be built on the site, and submitted her wish to the local Bishop. When the Bishop hesitated, and requested her for a sign, the Mother of God obeyed without delay or question to the Church's local Bishop, and sent her native messenger to the top of the hill in mid-December to gather an assortment of roses for the Bishop. After complying to the Bishop's request for a sign, She also left for us an image of herself imprinted miraculously on the native's tilma, a poor quality cactus-cloth, which should have deteriorated in 20 years but shows no sign of decay 476 years later and still defies all scientific explanations of its origin. An incredible list of miracles, cures and interventions are attributed to Her. Yearly, between 18 - 20 million pilgrims visit the Basilica, making it Christianity's most visited sanctuary. Altogether 25 popes have officially honored Our Lady of Guadalupe. His Holiness John Paul II visited her Sanctuary four times: on his first apostolic trip outside Rome as Pope in 1979, and again in 1990, 1999 and 2002. All written narrations about the apparitions of the Lady of Guadalupe are inspired by the Nican Mopohua, written in Nahuatl, the Aztec language, by the Indian scholar Antonio Valeriano around the middle of the sixteenth century. Ten years after the seizure of the city of Mexico, war came to an end and there was peace amongst the people; in this manner faith started to bud, the understanding of the true God, for whom we live. At that time, in the year fifteen hundred and thirty one, in the early days of the month of December, it happened that there lived a poor Indian, named Juan Diego, said being a native of Cuautitlan. Of all things spiritually he belonged to Tlatilolco. Having entered the city, and without delay, he went straight to the bishop’s palace, who was the recently arrived prelate named Father Juan de Zumarraga, a Franciscan religious. On arrival, he endeavored to see him; he pleaded with the servants to announce him; and after a long wait, he was called and advised that the bishop had ordered his admission. As he entered, he bowed, and on bended knees before him, he then delivered the message from the lady from heaven; he also told him all he had admired, seen, and heard. After having heard his chat and message, it appeared incredible; then he told him: “You will return, my son, and I will hear you at my pleasure. I will review it from the beginning and will give thought to the wishes and desires for which you have come.” He left and he seemed sad, because his message had not been realized in any of its forms. Juan Diego replied: “Lady, my Child, let me not cause you affliction. Gladly and willingly I will go to comply your mandate. Under no condition will I fail to do it, for not even the way is distressing. I will go to do your wish, but perhaps I will not be heard with liking, or if I am heard I might not be believed. Tomorrow afternoon, at sunset, I will come to bring you the result of your message with the prelate’s reply. I now take leave, my Child, the least, my Child and Lady. Rest in the meantime.” He then left to rest in his home. The next day, Sunday, before dawn, he left home on his way to Tlatilolco, to be instructed in things divine, and to be present for roll call, following which he had to see the prelate. Nearly at ten, and swiftly, after hearing Mass and being counted and the crowd had dispersed, he went. On the hour Juan Diego left for the palace of the bishop. Hardly had he arrived, he eagerly tried to see him. Again with much difficulty he was able to see him. He kneeled before his feet. He saddened and cried as he expounded the mandate of the Lady from heaven, which God grant he would believe his message, and the wish of the Immaculate, to erect her temple where she willed it to be. The bishop, to assure himself, asked many things, where he had seen her and how she looked; and he described everything perfectly to the bishop. Notwithstanding his precise explanation of her figure and all that he had seen and admired, which in itself reflected her as being the ever-virgin Holy Mother of the Savior, Our Lord Jesus Christ, nevertheless, he did not give credence and said that not only for his request he had to do what he had asked; that, in addition, a sign was very necessary, so that he could be believed that he was sent by the true Lady from heaven. Therefore, he was heard, said Juan Diego to the bishop: “My lord, hark! what must be the sign that you ask? For I will go to ask the Lady from heaven who sent me here.” The bishop, seeing that he ratified everything without doubt and was not retracting anything, dismissed him. Immediately he ordered some persons of his household, in whom he could trust, to go and watch where he went and whom he saw and to whom he spoke. So it was done. Juan Diego went straight to the avenue. Those that followed him, as they crossed the ravine, near the bridge to Tepeyacac, lost sight of him. They searched everywhere, but he could not be seen. Thus they returned, not only because they were disgusted, but also because they were hindered in their intent, causing them anger. And that is what they informed the bishop, influencing him not to believe Juan Diego; they told him that he was being deceived; that Juan Diego was only forging what he was saying, or that he was simply dreaming what he said and asked. They finally schemed that if he ever returned, they would hold and punish him harshly, so that he would never lie or deceive again. On the following day, Monday, when Juan Diego was to carry a sign so he could be believed, he failed to return, because, when he reached his home, his uncle, named Juan Bernardino, had become sick, and was gravely ill. First he summoned a doctor who aided him; but it was too late, he was gravely ill. By nightfall, his uncle requested that by break of day he go to Tlatilolco and summon a priest, to prepare him and hear his confession, because he was certain it was time for him to die, and that he would not arise or get well. As Juan Diego pointed out the spot where the lady from heaven wanted her temple built, he begged to be excused. He wished to go home to see his uncle Juan Bernardino, who was gravely ill when he left him to go to Tlatilolco to summon a priest, to hear his confession and absolve him. The Lady from heaven had told him that he had been cured. But they did not let him go alone, and accompanied him to his home. As they arrived, they saw that his uncle was very happy and nothing ailed him. He was greatly amazed to see his nephew so accompanied and honored, asking the reason of such honors conferred upon him. His nephew answered that when he went to summon a priest to hear his confession and to absolve him, the Lady from heaven appeared to him at Tepeyacac, telling him not to be afflicted, that his uncle was well, for which he was greatly consoled, and she sent him to Mexico, to see the bishop, to build her a house in Tepeyacac. Then the uncle manifested that it was true that on that occasion he became well and that he had seen her in the same manner as she had appeared to his nephew, knowing through her that she had sent him to Mexico to see the bishop. 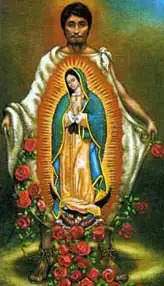 Also, the Lady told him that when he would go to see the bishop, to reveal to him what he had seen and to explain the miraculous manner in which she had cured him, and that she would properly be named, and known as the blessed Image, the ever-virgin Holy Mary of Guadalupe. Juan Bernardino was brought before the presence of the bishop to inform and testify before him. Both he and his nephew were the guests of the bishop in his home for some days, until the temple dedicated to the Queen of Tepeyacac was erected where Juan Diego had seen her. The bishop transferred the sacred Image of the lovely lady from heaven to the main church, taking her from his private chapel where it was, so that the people would see and admire her blessed Image. The entire city was aroused; they came to see and admire the devout Image, and to pray. They marveled at the fact that she appeared as did her divine miracle, because no living person of this world had painted her precious Image.